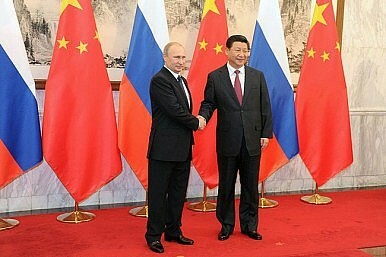 Early signs indicate that the Chinese and North Korean leaders will both visit Moscow in May. It’s becoming increasingly likely that North Korean Leader Kim Jong-un will choose Russia as the destination for his first trip abroad since assuming power. Kim has been invited to travel to Russia in May to attend celebrations marking the 70th anniversary of the end of the European portion of World War II. Russian Foreign Minister Sergei Lavrov recently said in a statement that the invitation received a “positive” response from Pyongyang, the latest indication that Kim will indeed make the trip. Lavrov also told the press that Chinese President Xi Jinping has “confirmed [his] participation in the festivities.” That raises an interesting scenario – Xi and Kim might have their first-ever face-to-face meeting on Russian soil. Writing for 38 North, Georgy Toloraya, Director of Korean Programs at the Institute of Economy at the Russian Academy of Science, notes that Kim’s visit to Moscow provides ample opportunities for Russia to broker third-party meetings – potentially even paving the way for a restart of the Six Party Talks. If this gamble pays off, it would help “bring Russia to the forefront of Korean affairs,” Toloraya writes. On the other hand, if the top leaders from China and North Korea do meet, even briefly, it would be a feather in Russia’s cap. Such a meeting would send a strong signal that China, North Korea, and Russia alike favor a return to dialogue — putting pressure on the U.S. to join in. Beijing has been publicly pushing for a return to the Six Party Talks for months, but the U.S. in particular has demanded preconditions that Pyongyang is unwilling to accept. A hypothetical trilateral meeting between Xi, Kim, and Russian President Vladimir Putin would bring together three of the “six parties,” a potential tipping point in resuming the defunct dialogue platform. From a bilateral standpoint, a Xi-Kim meeting would represent something of a breakthrough in China-DRPK relations under the Kim Jong-un regime. There’s been a sense of distance between Pyongyang and Beijing since North Korea conducted its third nuclear test in February 2013, just as Xi himself assumed power. Pyongyang reportedly acted despite sharp opposition from Beijing and the perceived provocation sparked a new round of discussions in China on whether or not to adopt a new approach toward its neighbor. However, China has responded warmly to recent overtures from Pyongyang to both Seoul and Washington. North Korea has offered to hold talks with South Korea and even to place a moratorium on future nuclear tests if the U.S. will agree to suspend joint military exercises with Seoul. In Beijing’s eyes (as well as the eyes of many Western analysts) this is a positive sign that both Washington and Seoul should take seriously. So far this year, China has been more frustrated with the U.S. response to Pyongyang than the other way around. If North Korea continues to make nice, it raises the likelihood of a Xi-Kim meeting in May. Still, a potential first Xi-Kim meeting taking place in Russia speaks volumes about the changed China-North Korea relationship. Kim has not yet been invited to visit China, although Chinese officials insist the relationship remains “normal.” Kim’s father and predecessor as North Korea’s leader, Kim Jong-il, made his first official trip abroad to China and returned there seven times in all. That Kim Jong-un has not received a similar invitation is taken as a sign of a rift in China-North Korea relations. If Kim and Xi meet for the first time in Russia, it will speak volumes not only about the state of their bilateral relationship, but about the growing role Russia plays in Korean affairs.